Asthma is a medical condition that is manifesting difficulty of breathing due to the constriction of the air passage, alveolus in the lungs and at rare cases the lungs too. The attacks brought by this condition may be graded as mild to life-threatening and the words imply the effects literally. Asthma is normally recurring and the effects ranges to discomfort to suffocation. Constriction of the airways, making the chest tight and breathing difficult, is worrying especially the young. Aromatherapy can help but it is important not to discontinue any meditation prescribed by your doctor. Using a vaporizer with 2 drops of atlas cedarwood and 4 drops of lavender at night will help sleep. The same oil can be used in bath. Remember to halves the quantities for children. Lavender is the best oils to use in asthma. It is relaxing and calming emotionally and a gentle antispasmodic that soothes and comfort distress. 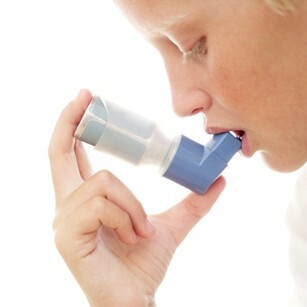 Another essential oils for asthma are Atlas cedarwood and frankincense. These essential oils are woody, comforting oils that help slow down the breathing, giving a sense of peace and openness the chest. For children age 3 until 10 can be treated for the conditions described above, but half the number of stated drops must be used. A vaporizer in the bedroom with 3 drops eucalyptus and 3 drops lavender will aid sleep. Chamomile is a good agent to use to prevent the abrupt occurrence of an asthma attack regardless of the grade. Studies have shown that this essential oil will stimulate the adrenal glands to produce cortisone that will decongest the lungs by reducing the inflammation. With the reduced inflammation, the person with asthma will manage to breathe easier. Lavender Chest Rub - The components of this blend are lavender essential oil (8 drops), chamomile essential (2 drops) and 20 drops of carrier oil. Combine these oils and used for chest rub done before bedtime. An herbal steam is also a good alternative using the same essential oil components. Any of these method of application; chest rub, hot lavender bath and steam, may be used on children even those who has manifested wheezing. In the interim of attacks you can use the chest rub blend and application. Essential oils are not to be used during asthma attacks. If you feel an onset of an attack, that is normally gradual, you may use the lavender steam that will relax the airways and normalizes the spasms. This could potentially prevent a full blown asthma attack from occurring. The following recipe may be used to aid in relieving asthma. Asthma Inhalation Rub - The blend is a combination of 6 drops of lavender oil, 4 drops of geranium oil and a drop of the following; marjoram, peppermint or ginger oil. An ounce of vegetable oil is added as carrier oil. Simply mix all the components and then rub on chest. Note that the application may be done before bedtime. Also, people with this condition are sensitive to scents so a sniff test must be done before application. The sniff test is to ensure the subject will not have any adverse reaction to the blend. Essential oils for Asthma Steam - A quarter teaspoon of eucalyptus oil and 3 cups of water are the components of this blend. Simmer water and add the essential oil. Use a clean towel to drape the back of your head while the combination is steaming. Inhale the vapor and come out of the drape once in a while for fresh air as needed. Three repetitions may be done in a frequency of several times in a day. An alternative to the essential oil you may use fresh or dried eucalyptus leaves. There is a list of essential oils that can be used for asthmatic subjects like lavender. The steam method may be used as often as desired. Caution: your eyes must be close when steaming as the steam may cause irritation to the eyes. From Essential oils for asthma back to Essential oils for respiratory system.